Fans in the Nutter Center Thursday night were going wild for more than just the basketball game. JJ Hill is just 10 years old, but he’s signed on to be Wright State University’s newest golfer. While he’s a little younger than the rest, he’s already proving to be a valuable member of the team. The night was one that JJ’s mother Carly thought might never happen. “I’ve watched him lay in an ICU before and not know,” she said. A national nonprofit is now joining in the first to change that. 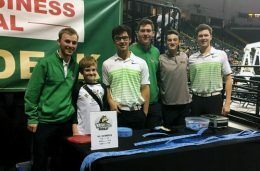 “Team IMPACT matches kids with serious and chronic illnesses to college sports teams across the country,” Director of Development Communications for Team IMPACT Mary Callaghan said. Wright State is one of 600 colleges in 48 states that are helping create life-long friendships. As a member of the team, JJ is getting the red carpet treatment and his own locker, but that’s just the beginning. Watch the story from ABC 22.